Tarragona is only an hour south of Barcelona by train, and in many ways is a mini-Barcelona culturally, without the huge crowds of tourists. 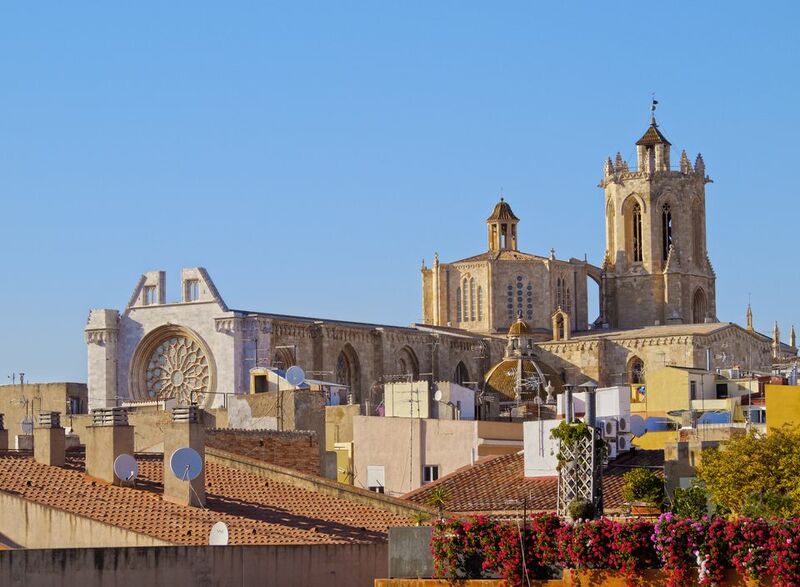 Some of Spain's best-preserved Roman ruins, a charming old town full of Gothic Architecture and the golden beaches of the Costa Daurada are just some of the many attractions. Here are our top things to do in Tarragona. The Roman amphitheatre, with its impressive setting beside the sea, is one of the chief highlights of a trip to Tarragona, just an hour's train ride south of Barcelona. Built in the 2nd Century AD, the amphitheatre is a stunning legacy of a time when Tarragona, or Tarraco as it was called, was one of the capitals of Roman-ruled Hispania. Walking around the tiered stands of this Roman amphitheatre, it is easy to imagine the spectacles which Roman citizens loved to enjoy - Gladiatorial contests, wrestling, gory executions, exotic animals; all were all on the bill. With such entertainments and a thrilling Mediterranean backdrop, Emperor Augustus amongst others was a keen attendant. Roman is not the only fallen civilization attested to on this site. Pitched in the centre of the stadium are the remains of a Visigothic church that was built in honour of the martyred Christian St Fructuos, killed in 259 AD. You can get a combined ticket for all of Tarragona's historic sites (minus the Archaeological Museum), including this amphitheatre, at the tourist office on Carrer Major. The amphitheatre is open to the public from 9 in the morning to 9 at night Tuesday-Saturday and until 3pm on Sundays. The Tarragona National Archaeological Museum, or MNAT, is found in Tarragona's old quarter (Casc Antic), in the Plaça del Rei. The museum harbors an impressive store of ancient artifacts, including Catalonia's greatest trove of remains from the Roman period, when Tarragona was the capital of an important Roman province. Occupying a 1960s neoclassical building wedged into the city walls, MNAT is justly famous for its classical treasures. There are Roman mosaics, including a Medusa's head and hunting scenes, while on the top floor there is a room dedicated to busts and statues, including the Roman emperors Trajan, Claudius and Hadrian, and a pantheon of mythical deities and beasts. Another collection likely to interest is the section dedicated to Roman domestic life, where you can see objects such as keys, belt buckles, bells and other fittings from daily life in antiquity. Also worth some time is an audiovisual room showing an educational video interpreting the history of Roman Tarragona. The museum is open 10-8 between Tuesday-Saturday and until 2 pm on Sundays. You can see the rest of Tarragona's historic attractions-- not including this one--for a reduced price by purchasing a combined ticket from the tourist office nearby on Carrer Major. Tarragona's 12th Century cathedral has elements of Romanesque and Gothic, is built in the Costa Daurada's distinctive golden sandstone and dominates Tarragona's old town. Tarragona's harbour is teeming with excellent seafood restaurants serving up paella negra (paella cooked in squid ink) and wine from the nearby Penedes vineyards. Pitch yourself up on a terrace, order a feast and enjoy the sight of the yachts bobbing up and down in the port. Perched loftily over the sea, Tarragona's old town (Casc Antìc) is a delightful labyrinth of meandering medieval alleyways, Gothic spires and colorful squares enclosed in the city walls. Tarragona's best beaches are out of town, along the Costa Daurada. Waikiki, Altafulla and Tamarit all offer exceptional stretches of golden sand, within half an hour of the city centre.